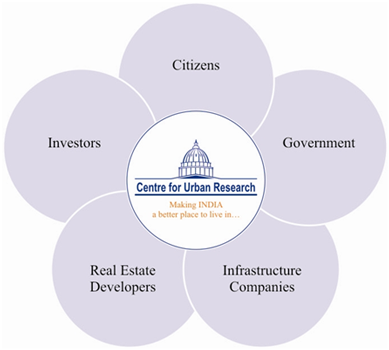 The center endeavors to bring about awareness amongst the citizens and so work for the betterment of the society at large Through Academic research and analysis of various burning issues which tend to affect one and all on a daily basis including transport, civic annenities, housing and governance. Another important goal of the center is to assist the Government in policy making based on the erudition of the expert volunteers from different fields and literature search conducted by the Center itself. The organization also intends to help Infrastructure Companies to procure accurate data and arrive at definite projections for fulfilling the future requirements of the people. A major focus of the center is to provide support to Real Estate Business and Developers by making them aware of various opportuinities in the market, business ethics and best market practices from around the world. It shall also provide consultancy in terms of current and projected market trends. The investors may also find the organization of assistance in terms of best availbale opportunities and safety tips for real estate investment.